We previously blogged about the beauty of Changdeokgung, but this summer we also visited the older, more imperial Gyeongbokgung! Gyeongbokgung was the primary palace since the inception of the Joeseon dynasty, and it’s huge. We visited with a friend on the same day we took him to Changdeokgung, and with the heat and lack of shade, we didn’t take in all of the palace grounds. One cool thing about Gyeongbokgung is the huge courtyard where all the officials would line up before the king, and walking through the courtyard and up to the throne room is impressive. 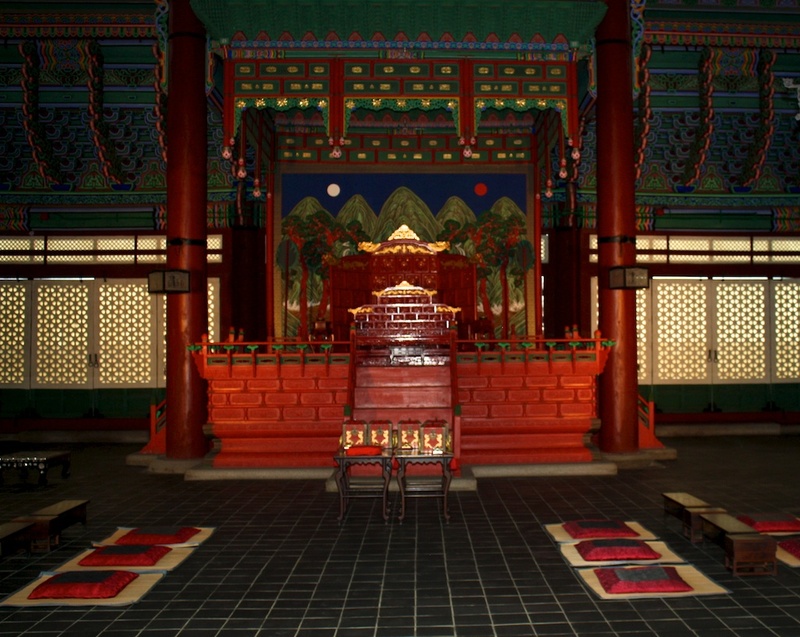 Everything about Gyeongbokgung is just a bit bigger, and grander, including the throne room, which definitely puts you in mind of scenes in the sagueks, and the grandeur of the royal court. Geyongbokgung also has a changing of the guard ceremony that you can observe at different times of the day. Zodiac statues top the steps leading up to the throne room. Hyangwonjeong pavilion sits on Hyangwonji pond. Sunnie and I visited a small art museum in Bangbae near her parents’ apartment, and they had this really cool video art display. Using a projector, famous Korean landmarks that are featured on paper money were put up on the wall, and you could hear the sound of birds chirping and the wind. When you looked close, you would notice a figure walking around and exploring the building. Hyangwonjeong was the first image in the display, and the figure of the artist walked around the building and then out of frame before it transitioned to another scene. Very cool. 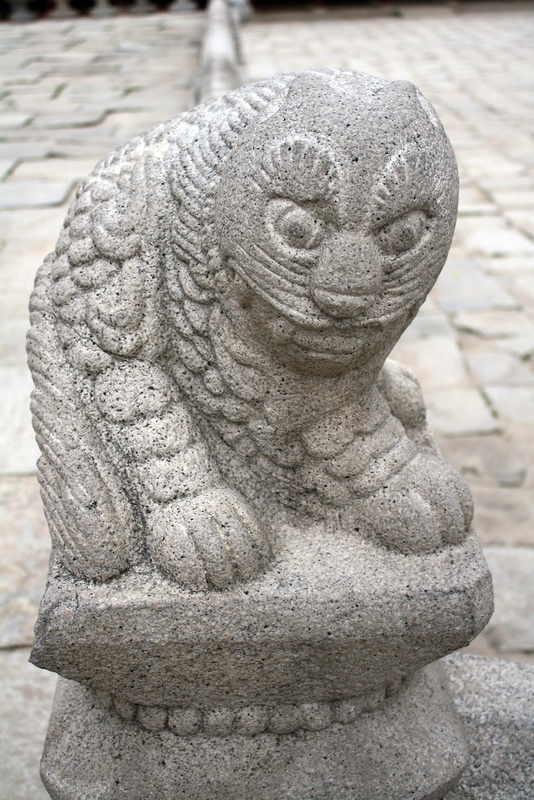 Gyeongbokgung is also great because it has the Palace Museum as well as the National Folk Museum. The Palace Museum had been closed for renovations since my first or second trip to Korea, so I wanted to check it out on this trip. 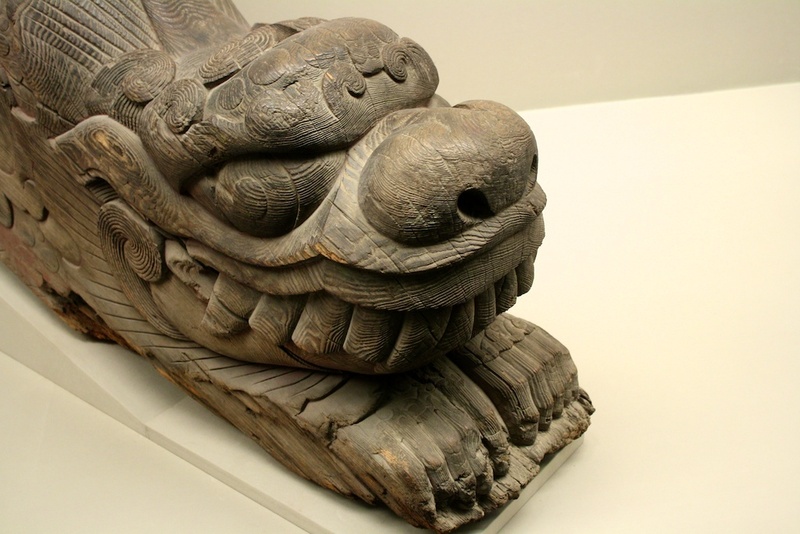 There are now stone versions of this sculpture at the bottom of the stairs leading up to the throne room, but at one time they were wooden. 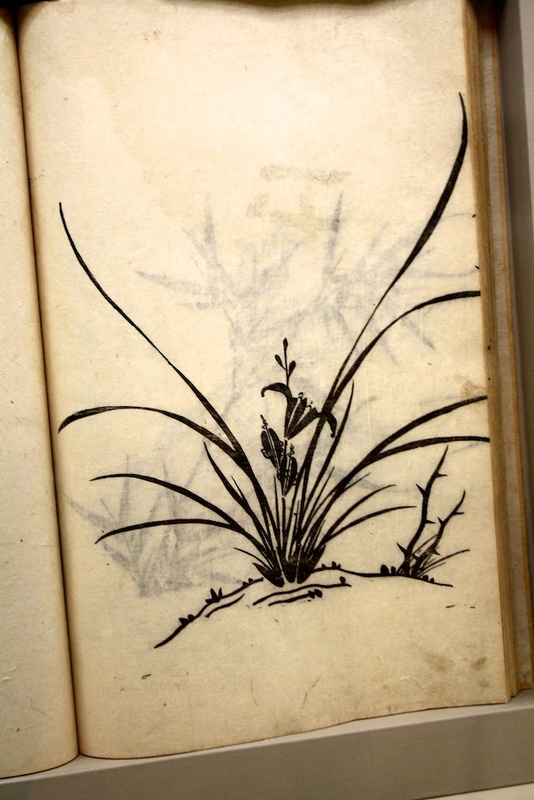 This was a painting of an orchid done by one of the King Sunjo. They were trained to be scholars and artists. After touring the palace museum, it was time for dinner, so we stopped by the restaurant inside of it where they serve royal cuisine – Deeurak (which means “little yard” in Korean). 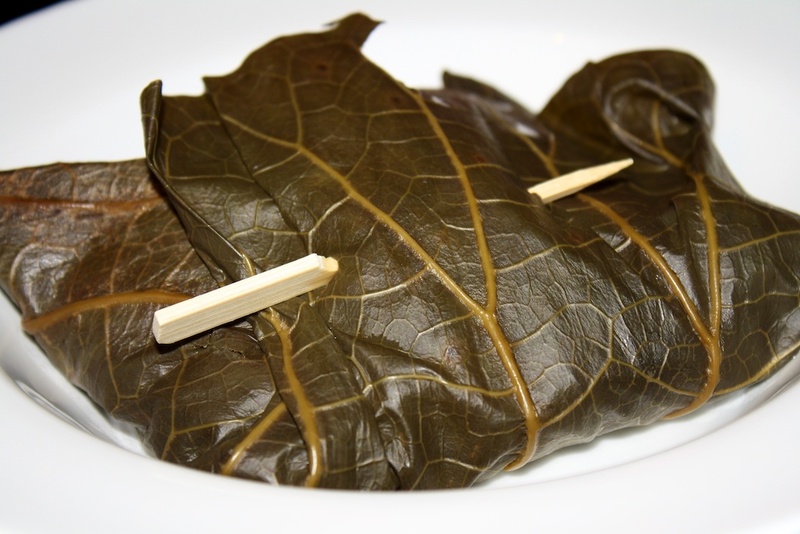 Sunnie had Yunkkotnip-ssambap (Lotus leaf sweet rice wrap). 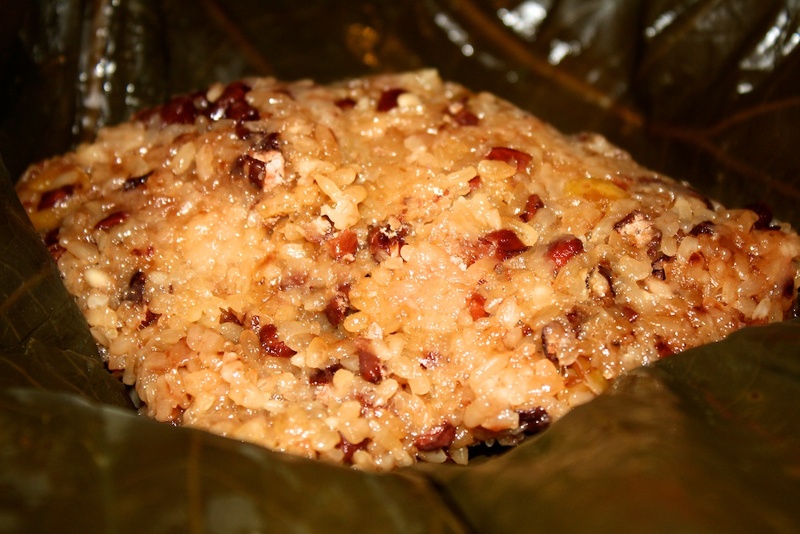 It was just a beautiful presentation and the lotus leaf flavor that had seeped into the multigrain sweet rice was really nice and simple. 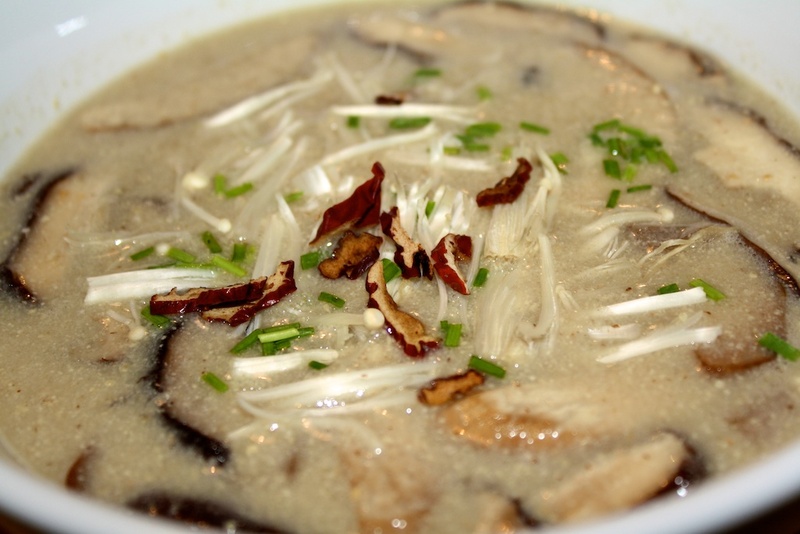 I had goonjoon-busut-deulkkaeu-tang (palace mushroom perilla seed soup). It had a stronger but still simple flavor, and I really liked it. It had enoki mushrooms and daechu (Korean dates, jujube) sprinkled on top. It was similar to the deulkkae gooksoo kkaennip I had at Sanchae but more upscale, and I think this had little pieces of rice cake in it instead of noodles. 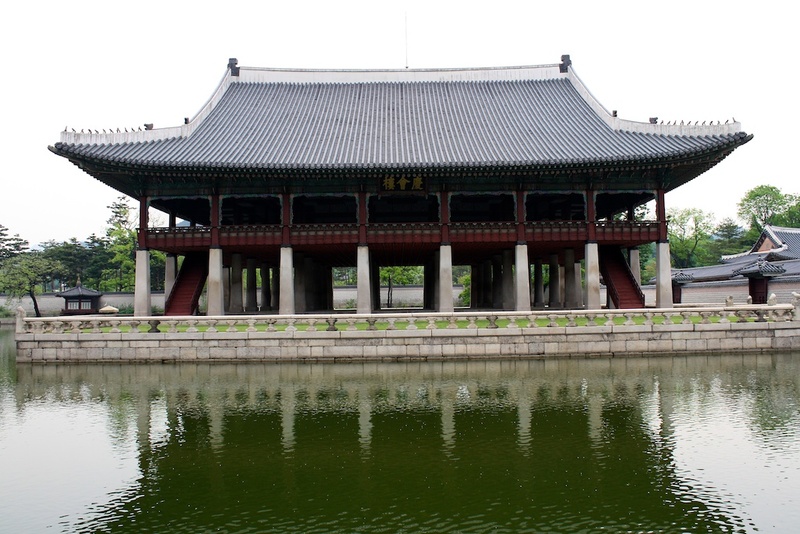 Although our favorite palace is Changdoekgung becuase of it’s natural settings, Gyeongbokgung is still a must-see. With two museums and huge grounds, it takes a long time to see everything. In fact, we still haven’t! Changdeokgung ang Gyeongbokgung are right by each other and near Insadong, so they make for a great day or two of activities in Seoul. Really, I’m absolutely in love with ur blog! the recipes, the pics… it’s amazing!.